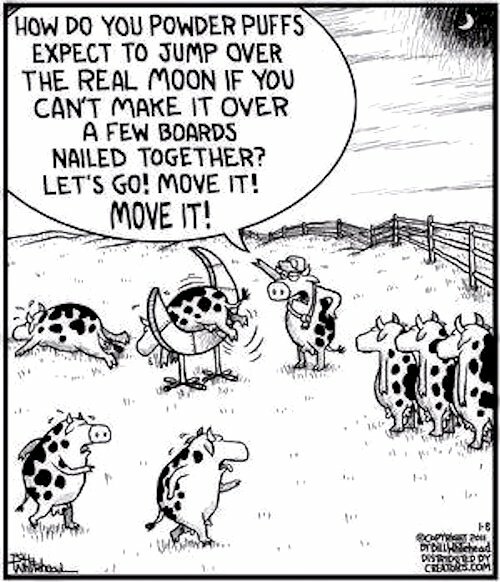 Always wondered how the cow managed to jump over the moon! Now I know! It really is worth it, Jim. Just being close to family and friends is more than enough! I am so happy that things are going so well with your new location. I am sure all your loved ones are equally happy about your moving closer. Thanks, Cheryl! We are so happy about this move. I love the last one! Happy Monday! Glad you liked it, Linda! I hope your week is going well. It's so good to hear that you are enjoying your new home so much! Great cartoons. I might print the towel one and post it in our bathroom just to tease Frank tonight. We both caught a bad cold from hanging out with our great-granddaughter when she was sick. So we sat in our chairs, in cold medicine induced comas for a Netflix marathon. I did, however, make the best pot of Beef Pho soup yesterday! If you're going to catch a cold, you may as well catch it from someone you love! I hope you're feeling much better. Sounds like you guys had a great weekend, Martha!! LOL with the cows over the moon and the stork's second job!! It was a good one, Betty. As long as we maintain a good balance, we'll make it through all this work! I spent most of the weekend editing. It felt good to accomplish so much. Why don't men know which towels to use? If we had a messy spill, my ex-husband would always manage to grab the nicest towels we had so he could ruin them. On the other hand, one time my son cut his hand pretty badly and X picked up a filthy rag to put around the wound. Clean towels and fresh paper towels were right there, but no, he had to find something laden with bacteria. I love the crash test dummies and the cows! Glad you had a good weekend. I bet your mom is happy you live closer now. She sure is. I also like being available to help her when she needs help. Thanks for the chuckles! It's so great to be closer to family. The first one and the last one both made me laugh out loud! 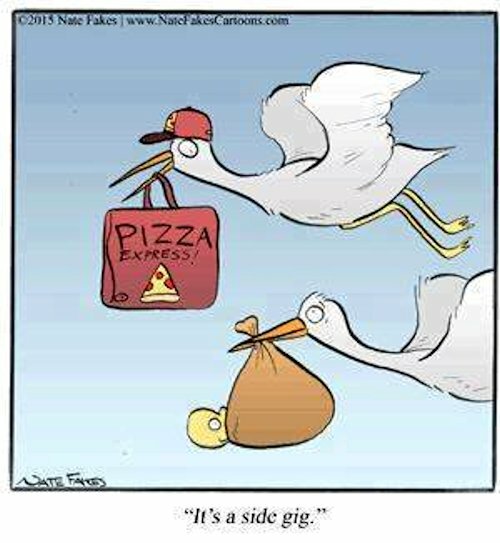 How else can a Stork afford Trumpcare? LOL... That's funny. I wasn't expecting that! We were out and about in the gorgeous countryside enjoying Spring like weather. Among other things, we saw a windmill and watermill and the hedgerows were just amazing. Sounds like you had a really nice weekend! I hope your week is going just as well. OHMYGOSH...of course! I LOVED The Friendly Giant. I never missed it. And I still feel my heart being squeezed when I think about that show. It was the best. 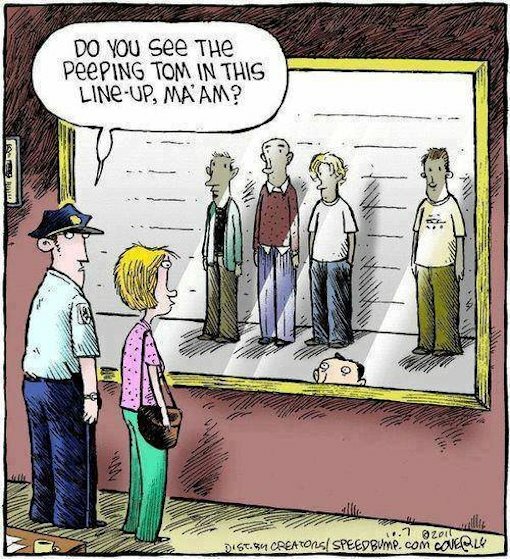 The peeping Tom was a sneaky one. You have to look hard sometimes. It is! It took me some time to figure it out. And then I laughed out loud! The closest one used to be about 2 hours away when we lived in Kingston. Now we have two stores within an hour's drive, which is great. LOL, I always love your funnies! I'm glad things are going so well for you. The better people who visit your wife's home...that's funny!! 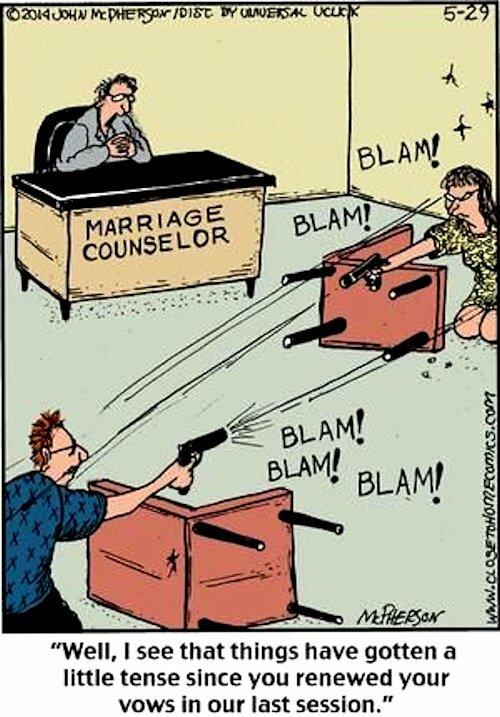 Some of those jokes are a bit realistic (e.g., the marriage counselor). That peeping Tom is creepy and made me laugh. Thanks, Martha. Have a great week in your new home. Thanks, Robyn! I hope you're enjoying a lovely week. This Chuckles and Chortles section of your blog never ceases to bring a smile on my face. It's been a long time. Hope you remember me. OF course I remember you! And I hope you are doing well. I bet your baby girl is so big now! life sounds fun for you - good news! it's suppose to be and you are showing how when you follow your heart - life opens up in ways you love. The move looks good on you. 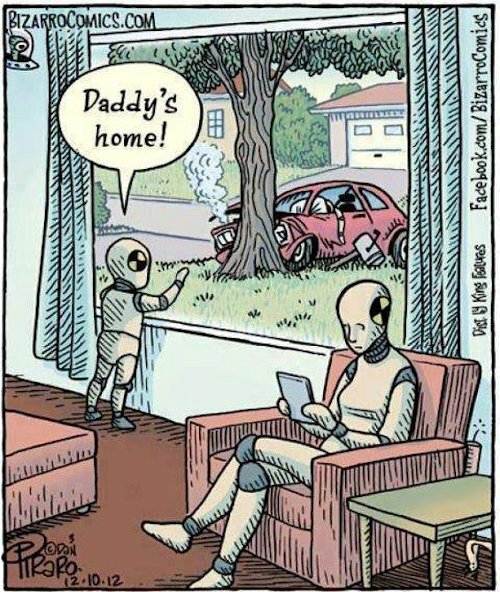 Love all the cartoons - always enjoy them. This is one of my favourite posts each week. It's fun gathering together images that will make my blogging pals laugh! 50 percent and 50 percent sounds darn perfect. It's been working great for us this way. No need to burn ourselves out. Nooooo need to burn yourselves out. For what? Nothing. Good on you.